Here are two transcriptions from the 1979 album Rosewood. Both tunes have long forms with several different sections, and Woody only takes one chorus on each tune. The Legend of Cheops is by Victor Lewis and for the most part has a samba feel to it. The opening section is in concert A, or B major for the trumpet – this is a very difficult key to play in but Woody copes with ease. In fact, the B pentatonic scale appears to be one of Woody’s favourites and he uses it in several of the solos I have transcribed (for example: If, What Is This Thing Called Love and Zoltan). He also spices things up a bit by inserting C naturals (eg. bar 16) and G naturals (eg. bar 18). Woody’s playing in this opening section is a mixture of strongly diatonic, pentatonic material and chromatic scales. From bar 41, the start of the next section, Woody does not venture outside the changes for the rest of the solo. Instead, he concentrates on constructing smoothly flowing, melodic lines, often using pentatonic scales but using them in an inside manner – for example, the I pentatonic over a I chord (as heard in the first 40 bars) can be heard at bars 41, 65 and 86, and the II pentatonic over the I chord can be heard at bars 57 and 85. Woody uses the pentatonic scales in an extremely melodic way. His time feel is, as usual, spot on, and I should make a special note of the phrase he plays between bars 52 and 56. This is an exquisite phrase and shows his complete mastery of articulation, as well as the ability to navigate wide intervallic leaps at speed with ease. The tempo on Rosewood, this one of Woody’s compositions, is again very fast, and his articulation and speed of fingers is astounding, particularly on the semiquaver passages. A fast tongue is essential to playing the wider intervallic leaps employed by Woody, and Woody has developed his tonguing ability to outstanding levels. I am not sure if he is maybe using double tonguing – however, this would also be incredible as double tonguing large intervals is extremely hard. As with The Legend of Cheops, much of the material is based on pentatonic scales. He uses pentatonics in some of the standard usages – for example, I pentatonic over a I chord (bar 4), V pentatonic over a I chord (bar 8), II pentatonic over a I chord (bar 13), and IV pentatonic over a sus chord (bar 25). But he also uses pentatonics as a means of playing outside. In bars 38-40 he uses chromaticism to switch from C pentatonic down to B pentatonic, then down again to B flat pentatonic, resolving with and F and G over the D-7 chord at the start of bar 40. Then over the Aflat maj7 chord in the next bar, he sets up to play a phrase using the E flat pentatonic scale, only to again use chromaticism to switch to B pentatonic, implying A flat minor – however, he still manges to ensure he resolves correctly with a C natural for the A-7 chord in bar 42. Bar 53 is also interesting – here he starts off playing using the B pentatonic scale, switching up a semitone to C pentatonic on the 4th beat, only for this new scale to become an inside sound as the chord moves to D-7 at the start of bar 54. This is another example of the anticipation of a change of chord, seen already on several other occasions in other solos I have transcribed. Bars 62 to the end are also very effective – here Woody plays almost exclusively notes from the E flat pentatonic scale over shifting chords. The scale is consonant with each chord except for the passing chord of A7sus, and creates a stable frame of reference on top of the shifting harmonies underneath. NOTE: Due to a complaint from Victor Lewis, the composer of ‘The Legend of Cheops’, I have removed the transcription of Woody’s solo on this tune. This album was Woody’s follow up to Blackstone Legacy, and features Emanuel Boyd on flute and tenor sax, Ramon Morris and Bennie Maupin on tenor saxes, George Cables on piano and keyboards, Henry Franklin on bass and Woodrow Theus II on drums. All four tunes on the album are composed by Woody, and he is beginning to develop his own compositional voice. The music is generally pretty avant garde and reveals the influence of several key musicians. The influence of John Coltrane can be heard in the extended sections of collective, free improvisation over drones, especially in the first tune, Song of Songs, and the last tune, The Awakening. This tune also morphs into a funk groove which sounds very similar to the type of music being made by Miles Davis during this period. The Goat And The Archer, the second tune on the album is loosely based on a blues structure in F concert, although the actual chords being played are constantly changed by the musicians in a manner reminiscent of the tune If from the album Unity (see post below). The third tune, Love: For The One You Can’t Have is a beautiful tune which fits in neatly with the evolution of Woody’s compositional technique. I need to transcribe this tune, as well as others, to try and see what principles he used and developed when composing. You Stepped Out Of A Dream is taken from the 1986 album Solid, and whilst it is not a particularly adventurous solo harmonically, it is still a very impressive solo. Woody’s sound and sense of melody on the solo are fantastic, and his time feel is impeccable. He uses a lot more scalic passages than he did as a younger man, and the big intervallic leaps are becoming less evident. Woody uses several sequences in the solo to great effect – for example, bars 1-4, 15 and 57-58. The use of pentatonic scales is sometimes evident – for example, bars 79-80 – but they are less key to Woody’s approach to improvisation than they were a few years earlier. This is a more mature and more melodic improvisational style, one less focussed on ‘outside’ playing and large intervallic leaps. 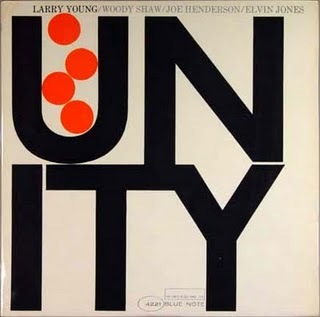 Woody’s solo on the Joe Henderson blues If, taken from Larry Young’s Unity album, is a very interesting solo. The chords I have put on the solo are some standard blues changes – however, neither Woody nor Larry Young stick to a distinct set of changes, and I have put these in as a reference only. For much of the solo, Woody jumps between two pentatonic scales – B flat major and B major. The B flat pentatonic scale creates an inside, bluesy sound, and can be played over the whole chord sequence without ever really sounding dissonant. The B pentatonic scale is used as a contrast as it doesn’t really fit with any of the underlying harmony. Woody switches between the two scales at will and uses the dissonant B pentatonic scale on all sections of the chord sequence, the only consistent aspect being a consonant resolution at the end of each chorus. I really like the way he varies rhythmically how he links the two scales together, only rarely allowing the change to fall on a barline. This is a novel way of playing on the blues – Woody takes two scales, one consonant and one dissonant, and juxtaposes them to create tension and release. The fruits of such an approach can be seen in his later recordings, and this is a key idea I need to incorporate into my own practice. This is a truly masterful solo, and Woody was only 20 years old at the time! Joe Henderson and Elvin Jones appear alongside Woody and Larry Young on this album, in many ways a breakthrough album for Woody. He was only 20 years old at the time, and three of his original tunes are featured on the album – Zoltan, The Moontrane and Beyond All Limits. Although Woody’s playing is not as fluid as it would be in a few years time, and his time feel is sometimes not spot on (especially on the up tempo numbers), overall his contribution to the album is very impressive. He is definitely beginning to find his own voice on the trumpet, and has clearly been checking out his pentatonic scales, as well as ways of playing ‘outside’ the harmony. A similar approach can be heard in the organ playing of Larry Young – like Woody, he was from Newark, New Jersey, and the two of them had played together for several years. Woody has attributed much of his harmonic knowledge to Larry Young in an interview with the now defunct ‘Musician’ magazine. The first track is a composition by Woody entitled Zoltan and features a march theme by the Hungarian composer Zoltan Kodaly which utilises the pentatonic scale. The second theme is also composed entirely out of pentatonic scales. Woody uses the pentatonic of the II over a I chord, creating a lydian sound. The other compositions by Woody are The Moontrane, a tribute to John Coltrane, and Beyond All Limits, an incredibly fast swing number. Both are difficult tunes to play with lots of complicated chord changes and reflect the ambition of the young trumpet player. Woody’s best solo on the album, however, comes on the Joe Henderson tune If. This is a blues in F (concert), and the medium tempo and familiar structure means that Woody is free to explore his new method of using pentatonic scales to play ‘outside’ the standard chord changes. 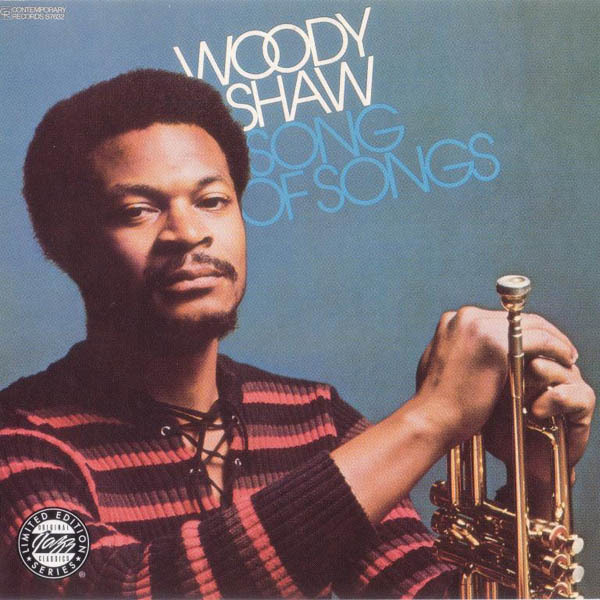 Woody’s sound on this album is still very similar to Freddie Hubbard, but he has now moved into new harmonic realms unexplored by the older trumpet player.